We love when Tampa Bay couples take a traditional wedding theme and give it a modern twist, which is why we’re swooning over this modern, Roaring 1920’s styled wedding shoot. 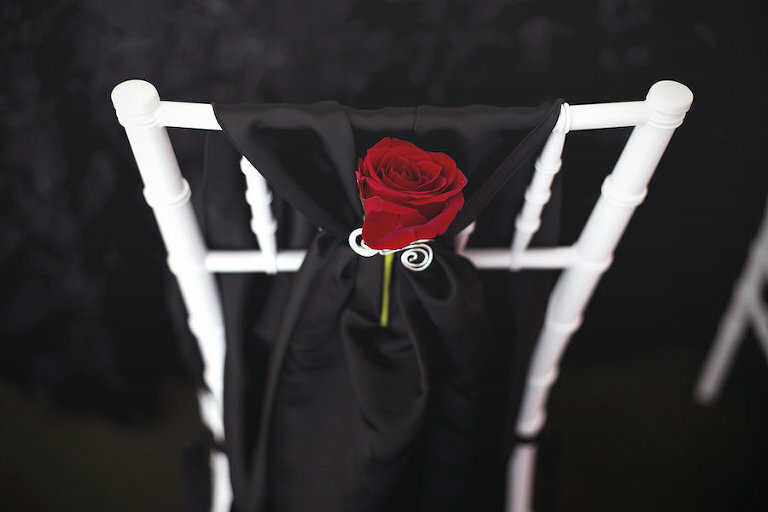 The creative team of The Vault, Apple Blossoms Floral Design and Special Moments collaborated to create a modern, elegant design with vintage elements. 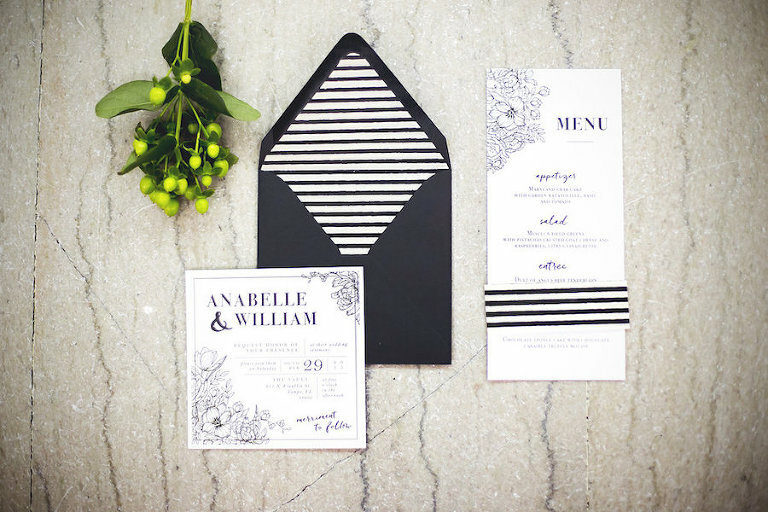 “A classic black and white color combination will never go out of style, and we felt the classic black tie affair from the Roaring 1920’s, with a modern twist was going to be timeless look,” Tampa wedding planner Tammy Waterman of Special Moments shared. 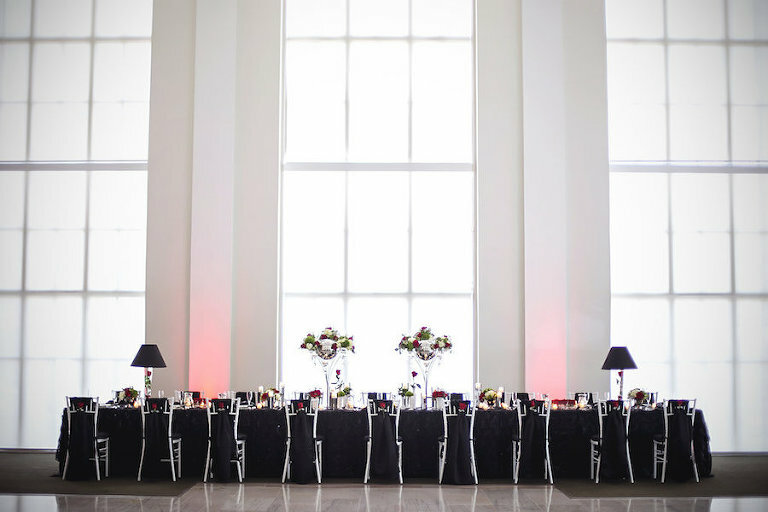 The natural light from the floor-to-ceiling windows of downtown Tampa wedding venue The Vault, paired with white chiavari chairs and mirrored chargers lightened up the rich black and red color combination of the reception decor. The mix of high and low centerpieces, provided by Tampa wedding florist Apple Blossoms Floral Design, added depth to the long feasting tables, which complemented the venue’s 35-foot tall ceilings and updated the look of traditional round dinner tables. One of our favorite elements of the Vault’s “blank canvas” reception space is the transformation that takes place once the sun sets. 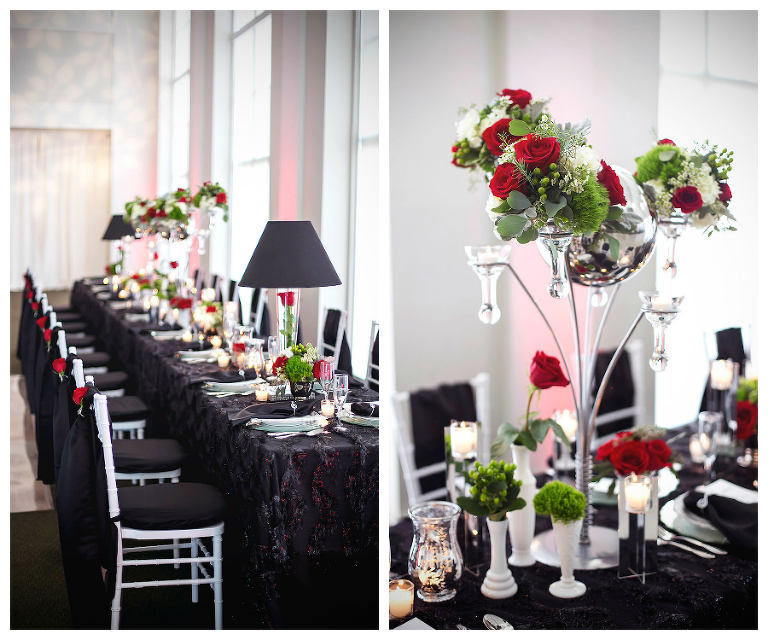 Red uplighting and a monogrammed gobo transitioned the room from an elegant dinner to chic lounge. This styled wedding shoot was the brainchild of Downtown Tampa Weddings co-founder and lead photographer Jessie Stehlik of Foto Bohemia.